Wales Book of the Year 2018. Winner of the 2018 Roland Mathias Poetry Award. Shortlisted for the 2017 T.S. Eliot Prize. 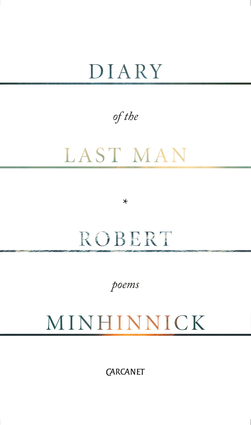 The opening poem sequence, "Diary of the Last Man," sets the tone for Robert Minhinnick's book, a celebration of the dwindling Earth, an elegy, a caution. His Wales is a touchstone; other landscapes and cityscapes are tried against it, with its erratic weather, its sudden changes of mood, "a black tonic." The sequence remembers all the geographies of his earlier work, old and new world, but now unpeopled and the lonely spirit free to go anywhere, do anything, but meaning with mankind has drained away. Yet still alive, and still with language, registering. The rest of the book is filled with voices: of children, of rivers, terrorists, magicians; and voices translated from the Welsh, and from Turkish and Arabic, shared, enriching with their difference, their other worlds. History washes over and washes up on the strand of this Welsh book. It is seen and recognised, it begins to be transformed. In the long concluding poem, "The Sand Orchestra," the poet returns to his own voice, and to the voice of a Bechstein piano abandoned in the open air, played now by nature, its winds and sand. The last man, who has been looking for Ulysses, is the very man he has been looking for. Robert Minhinnick was born in 1952 and lives in south Wales. He has published nine collections of poetry, including The Adulterer's Tongue, translations of works by six Welsh poets. He has been the winner of a Society of Authors Eric Gregory Award and a Cholmondeley Award, and has twice won the Forward Prize for best individual poem. His books of essays have twice won the Wales Book of the Year Prize. His first novel, Sea Holly, was published by Seren in 2007. Robert Minhinnick edited Poetry Wales magazine from 1997 to 2008. He co-founded Friends of the Earth (Cymru) and Sustainable Wales, and is an advisor to Sustainable Wales.